PTV Group improves mobility and transport – by using world-class software, data and scientific know-how gained from four decades of experience in planning and optimising the movement of people and goods. Recognised as global market player with German technology, we help cities, companies and people save time and money, enhance road safety and minimise the impact on the environment. Based on our unique expertise in every facet of mobility, we support smooth traffic flow. In the Logistics business field, our portfolio ranges from software for scheduling transport routes and trips to distribution planning and fleet management, including truck navigation and parking. A special online service provides real-time transparency during the transport process and across the entire supply chain. In the Traffic business field, we offer state-of-the-art technologies for traffic planning, transport network modelling and simulating across all modes of transport, including real-time traffic management as well as Mobility-as-a-Service (MaaS) solutions. PTV software is used to develop the European transport model, which encompasses all passenger transport and freight movements in Europe. Our headquarters have been located in Karlsruhe – a centre of innovation and development – since the company was founded in 1979. We currently have more than 800 colleagues worldwide committed to driving the high performance of our products. We are a smart software company for transport and traffic. We are a global player with products made in Germany. We communicate at eye level. We cultivate open communications from person to person as well as a constructive feedback culture. We treat each other with fairness and respect. We responsibly create room to manoeuvre. The heart of our commercial success is the product business. As an expert for traffic and transport we actively shape the market with our solutions - now and in the future. At the same time we consistently extend our market leadership. We continually develop our products based on customer feedback, continuous observation of the market as well as knowledge gained from research. We face new things with an open mind in order to deliver the best solutions for tomorrow - we therefore promote and demand creativity and technical innovation. We market our services with passion and strive for profit, but not at any price. We share the same values and believe in our common objective. We thereby portray a clear image to the outside world and reinforce the perception of our brands. With our goal in mind, we make decisions and put them into practice. We concentrate on what is essential, clear up important issues and make the results transparent. We see our different corporate cultures as an opportunity to learn from each other and to grow together. We plan and optimise everything which moves people and goods worldwide. That's our vision. We are the ones behind the scenes who make sure that everything which is moving around arrives punctually and safely. PTV Group celebrates its 40th anniversary under the theme ‘Shaping tomorrow since 1979’. With PTV Optima, PTV provides the core technology for the new, future-oriented traffic management system of the City of Sydney. PTV Group is one of the strategic partners developing Singapore's first test centre for autonomous vehicles. Set up of international virtual mobility labs. Successful internationalisation of the transport logistics business – both within and outside Europe. Porsche Automobil Holding SE, Stuttgart, becomes the new owner of PTV Planung Transport Verkehr AG. As a financially strong investor, Porsche SE supports the innovation and growth strategy of the entire PTV Group with all its offices around the world. PTV launches its MaaS (Mobility-as-a-Service) Accelerator Program, a software component portfolio designed to help city administrations and operators plan, operate and manage their MaaS processes. PTV software is used to develop the pan-European transport model for the EU Commission. As a new European standard, it will model in detail all freight and passenger transport movements across Europe. The company receives World Market Leader and Best of German Mittelstand Award. PTV invests in the development of apps, e.g. Truck Parking Europe, the largest free platform for HGV parking facilities in Europe. Vincent Kobesen succeeds company founder Dr.-Ing. 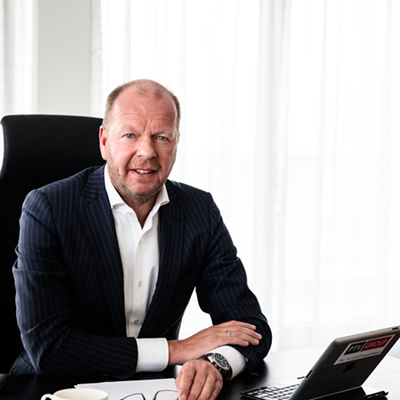 Hans Hubschneider as CEO. PTV receives prestigious World Leader Seal from German Standards Editions. PTV launches the first professional route planner that allows for qualified calculation of emissions. The company introduces the first multi-modal microscopic simulation program that can model realistic interactions between pedestrians and vehicles. Foundation of the PTV AG as stock corporation under German law through merger of five individual companies. Expansion of international activities and development of regional organisations and partners in the USA, UK, France, Italy and the Netherlands. Company moves into its newly constructed office building in Karlsruhe. PTV opens its first branch office: PTV system Software and Consulting, focusing on traffic and transport planning. Formation of further GmbHs (private limited companies). PTV develops first software solution for trip planning. Hans Hubschneider and Michael Sahling set up PTV Planungsbüro Transport und Verkehr GmbH as a spin-off of Karlsruhe University (TH), now Karlsruhe Institute for Technology (KIT).